Please note that these controllers are shipped with the RF remote pre-programmed for operation with the controller. You do not have to do any setup if you are going to use it as a stand-alone controller. These instructions would only be used if you change the remote control, or build a group of controllers. The first step is to remove the controller housing cover. Do this by gently prying the backing plate out of the housing at the sides; there are some small plastic tabs that normally snap into place when you close it up again. The above schematic shows the layout of the pigtail wiring harness terminals, as seen looking from above the board. Press the remote control FORWARD button until flashing stops - the FORWARD function is successfully programmed. Press the remote control STOP button until the flashing stops - the STOP function is successfully programmed. Press the remote control REVERSE button until the flashing stops - the REVERSE function is successfully programmed. This 10 amp controller has the special ability to 'learn' RF remote control codes, allowing it to be used in a 'one-remote-to-many-controllers' system, or vice versa in a 'one-controller-to-many-remotes' configuration. 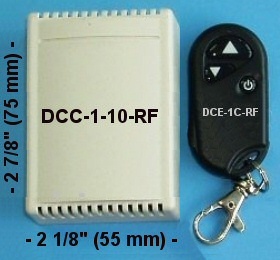 The RF radio remote has the ability to reach through walls and will work from any location in a typical household. 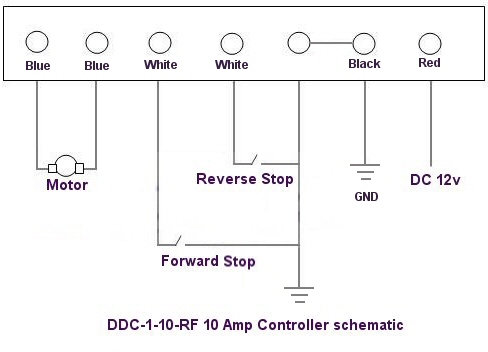 It is a full reversing controller, with forward-reverse-stop latching capability. This remote is suitable for use with our RollerTrol™ tubular motors that enable you to make any size of custom panel, screen or window covering. We supply the tubular motor (works with this remote control), and mounting brackets - you supply the custom 1.5" ID roller tube (readily available anywhere tubing is sold) and roller material. We sincerely hope you enjoy using these advanced controllers; if you have any questions, please feel free to contact us at any time!